The Paris Institute of Political Studies (French: Institut d'Études Politiques de Paris, French pronunciation: ​[ɛ̃s.ti.ty de.tyd pɔ.li.tik də pa.ʁi]), commonly referred to as Sciences Po (French pronunciation: ​[sjɑ̃s po]), is the primary institution of higher learning for French political and administrative elite, and one of the most prestigious and selective European schools in the social sciences. It was founded in 1872 to promote a new class of French politicians in the aftermath of the French defeat in the Franco-Prussian War of 1871, and has since educated, among others, 32 heads of state or government, 7 of the past 8 French Presidents, 3 past heads of the International Monetary Fund, heads of international organizations (including the UN, UNESCO, WTO, IMF, EP and ECB), and 6 of sitting CAC 40 CEOs. The school is also the alma mater of numerous intellectual and cultural figures, such as Marcel Proust, René Rémond, Paul Claudel, and Raymond Aron. In 2019, it was ranked as the world's 3rd best school for politics and international relations. Sciences Po undertook an ambitious reform agenda starting in the mid-1990s, which broadened its focus to prepare students for the private sector, put an emphasis on the internationalization of the school's curriculum and student body, and established a special admission process for underprivileged applicants. It also expanded outside Paris by establishing additional campuses in Dijon, Le Havre, Menton, Nancy, Poitiers, and Reims. The institution is a member of the Association of Professional Schools of International Affairs and the Global Public Policy Network. 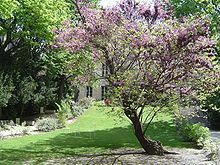 Sciences Po was established in February 1872 as the École Libre des Sciences Politiques (ELSP) by a group of French intellectuals, politicians and businessmen led by Émile Boutmy, and including Hippolyte Taine, Ernest Renan, Albert Sorel and Paul Leroy Beaulieu. The creation of the school was in response to widespread fears that the inadequacy of the French political and diplomatic corps would further diminish the country’s international stature, as France grappled with the aftermath of a series of crises including the defeat in the 1870 Franco-Prussian War, the demise of Napoleon III, and the upheaval and massacre resulting from Paris Commune. The founders of the school sought to reform the training of French politicians by establishing a new "breeding ground where nearly all the major, non-technical state commissioners were trained.". ELSP proved very successful at preparing candidates for entry into senior civil service posts, and acquired an image as a major feature of France’s political system. From 1901 to 1935, 92.5% of entrants to the Grands Corps de l'État, which comprises the most powerful and prestigious administrative bodies in the French civil service, had studied there (this figure includes people who took civil service examination preparatory classes at Sciences Po but did not earn a degree).. In August 1894, the British Association for the Advancement of Science spoke out for the need to advance the study of politics along the lines of ELSP. Sidney and Beatrice Webb used the purpose and curriculum of Sciences Po as part of their inspiration for creating the London School of Economics in 1895. Sciences Po underwent significant reforms in the aftermath of France's liberation from Nazi occupation in 1945. The humiliation of France's surrender to Nazi Germany and the collapse of the Vichy regime provided the impetus for a major restructuring of the state's institutions. 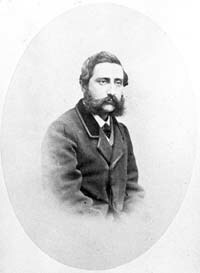 Charles de Gaulle, as leader of France's Provisional Government, appointed Michel Debré to overhaul the recruiting and training of public servants. Even though eight of thirteen ministers in De Gaulle's government, including Debré himself, were Sciences Po alumni, a significant reform of the university seemed inevitable, as it had been instrumental in training the class of leaders whom many accused of complacency in face of Nazi aggression. Communist politicians including Georges Cogniot proposed abolishing the ELSP entirely and founding a new state-run administration college on its premises. Debré proposed the compromise that was eventually adopted. First, the government established the Ecole Nationale d'Administration (ENA), an elite postgraduate college for training government officials. From then on, the Grands Corps de l'Etat had to recruit new entrants from ENA. The change, however, had little impact on Sciences Po's central role in educating the French elite. Although it was now the ENA rather than Sciences Po that fed graduates directly into senior civil service posts, Sciences Po became the university of choice for those hoping to enter the ENA, and so retained its dominant place in educating high-ranking officials. The public-private nature of Sciences Po, Paris, also distinguish it from a network of institutes of political studies throughout the country that were inspired by its curriculum, namely in Strasbourg, Lyon, Aix, Bordeaux, Grenoble, Toulouse, and then in Rennes and Lille. They are not to be confused with the seven campuses of Sciences Po in France. Between 1952 and 1969, 77.5% of the ENA’s graduate student intake were Sciences Po alumni. FNSP further strengthened its role as a scientific publication center with significant donations from the Rockefeller Foundation. FNSP periodicals such as la Revue française de science politique, le Bulletin analytique de documentation, la Chronologie politique africaine, and the Cahiers de la Fondation as well as its seven research centres and main publishing house, Presses de Sciences Po, consolidated the university's reputation as a research hub. Sciences Po underwent various reforms under the directorship of Richard Descoings (1997–2012). In these years, Sciences Po introduced a compulsory year abroad component to its undergraduate degree, and began to offer a multilingual curriculum in French, English, and other languages. It was during this period that Sciences Po added its regional campuses. Sciences Po also implemented reforms in its admissions process. Previously, Sciences Po recruited its students exclusively on the basis of a competitive examination. This system was seen to favor students from prestigious preparatory high schools or those who could afford year-long preparatory courses. In 2001, Science Po founded the Equal Opportunity Program governing council widened its admissions policy. This program enables the institution to recruit high-potential students at partner high schools in France who, due to a social and financial constraints, would not otherwise have applied to Sciences Po. This process has been accused of being superficial and being in fact a "lotto for poor people". From 2001 to 2011, the proportion of scholarship students at Sciences Po went from 6 percent to 27 percent. Descoings was accused of "reigning as almighty master on his school, by distributing material advantages and "small envelopes", and setting up a clientelist and authoritarian "carrot system"" and to implement a "management of fear". Frédéric Mion, a graduate of Sciences Po, ENA and École Normale Supérieure and former secretary general of Canal+, was appointed president of Sciences Po on 1 March 2013. His intention to pursue Sciences Po's development as a "selective university of international standing" is detailed in the policy paper "Sciences Po 2022", published in the spring of 2014. The restructuring of Master's study into graduate schools continued with the creation of the School of Public Affairs and the Urban School in 2015 and the School of Management and Innovation in 2016. In early 2016, Sciences Po updated its governance structure, adopting new statutes for its two constituent bodies: the Fondation nationale des sciences politiques (FNSP) and the Institut d'études politiques de Paris (IEP). This reform is "the most significant since 1945" and clarifies Sciences Po's governance with new rules, which address observations made by the Cour de comptes in a 2012 report. In late 2016, Sciences Po acquired a new site, the Hôtel de l'Artillerie in the 6th arrondissement of Paris, which it intends to make the new heart of its urban campus and a seat of "educational renewal". In April 2018, Sciences Po students peacefully blocked the main entrance to the school in protest against Macron's education reforms which, while giving public Universities the power to set admission criteria and rank applicants, may violate the principle of free education for all. While Sciences Po is not affected by this legislation by virtue of it being a private University, students stood in solidarity with protestors at public Universities. Sciences Po has seven campuses in France. 56, rue des Saints-Pères: Language Lab, audiovisual service and a cartography workshop. In 2016 Sciences Po purchased the Hôtel de l’Artillerie, a 17th-century former monastery located 200 meters from its campus on Rue St.Guillaume. The building was previously the property of the French Ministry of Defense and is 14,000 m2 in size. The university has announced its intention to refurbish the building as a major addition to its facilities in Paris. It is estimated that this project will cost around 200 million euros in total. The Hôtel de l’Artillerie will house new facilities for Sciences Po’s graduate programs, including a courtroom for the Law School and a newsroom for the Journalism School. It will also incorporate a cafeteria, study areas and accommodation for 50 to 100 students on scholarships. Frédéric Mion, the director of Sciences Po, stated his intention to create a campus comparable in quality and capacity to Sciences Po’s most prominent international partner universities such as Columbia University, the London School of Economics and Hong Kong University. Work will begin at the site in 2018. It is scheduled to open in 2021. Located in the region of Burgundy in a magnificent 19th century building, the Dijon campus was created in 2001. Located on the coast of Normandy, Le Havre has hosted the undergraduate Euro-Asian campus since 2007, recently celebrating the 10 year anniversary of the campus in September 2017. With a choice between 3 majors, including economics and society, politics and government and political humanities, students primarily choose to spend their third year abroad in an Asian country. Furthermore, Le Havre is home to several Dual Degree programs, and welcomes international students from over thirty countries from all around the world. The Le Havre campus is primarily known for its vibrant campus culture, upholding numerous artistic and sports clubs and celebrating important Asian holidays, such Diwali and Chinese New Year. Being situated only two hours away from Paris, the students of this campus are especially fortunate to meet with exceptional guest speakers and be taught by remarkable professors. Established in the French Riviera city of Menton in 2005, the campus is located in an entirely renovated 19th-century building overlooking the Mediterranean. Menton is home to the Middle Eastern and Mediterranean focus branch of Sciences Po. Students study in one of two tracks (anglophone/francophone) and may take one of three core Oriental languages (Arabic, Farsi, or Turkish) and an additional concentration language (Italian or Hebrew) if they are fluent in their core language. The third mandatory year abroad is spent in the Middle East or elsewhere. The Menton campus takes part in the dual BA programmes with Columbia University, University College London, the National University of Singapore, the University of British Columbia, the University of California, Berkeley, the University of Hong Kong and the University of Sydney. Established in the region of Lorraine in 2000, the Nancy campus is located in a prestigious 18th century heritage site, the Hôtel des Missions Royales. The curriculum is taught in French, English and German, as it focuses on the European Union and French-German relations. Opened in 2010, the campus is located in the heart of the historic city of Poitiers in the Hôtel Chaboureau, a renovated building dating from the 15th century. The academic programme is focused on Latin America and the Iberian Peninsula. In the heart of the Champagne region, the Reims campus opened in September 2010. It is housed in the 17th century College des Jesuits. It is by far the largest of the regional campuses of Sciences Po, hosting both the Europe-North America program and the Europe-Africa Program as well as an exchange program. In addition to the traditional undergraduate programs, the Reims campus is also host to several dual degree programs, including ones with Columbia University and the University of California, Berkeley. As of the beginning of the academic year in 2018, there were roughly 1500 students enrolled across all three programs. In the fall of 2017, a brand new section of the campus, complete with a new cafeteria and amphitheater was opened to accommodate even more students. The academic bodies of Sciences Po consist of the University College, six professional schools, and the Doctoral School. The university also contains a library system, the Presses de Sciences-Po, and holds ties with a number of independent academic institutions, including Columbia University, King's College London, the National University of Singapore, and the Sorbonne Paris Cité alliance. The Sciences Po Undergraduate College offers a three-year Bachelor of Arts degree with a multidisciplinary foundation in the humanities and social sciences with emphasis on civic, linguistic, artistic, and digital training. On all campuses, students choose a multidisciplinary major - Politics & Government, Economies & Societies, or Political Humanities. In addition, each campus offers a different regional concentration that anchors students intellectual objectives : Africa, Asia, Europe, Latin America, Middle East-Mediterranean, and North America. Sciences Po offers dual bachelor's degrees with Columbia University, Keio University, University College London, Freie Universität Berlin, University of British Columbia, the University of Sydney, the National University of Singapore, the University of Hong Kong, University of California Berkeley. At the graduate level, Sciences Po's seven schools offer one- and two-year Master's programmes and PhD programmes. All graduate programmes are delivered on the Sciences Po campus in Paris. Sciences Po also hosts dual Master's programmes with international partners. Students enrolled in these dual degree programmes spend one year at Sciences Po in Paris and one year at the partner university. The Doctoral School offers Master and PhD programmes in law, economics, history, political science, or sociology. The PhD programme contains roughly 600 doctoral candidates. Research at Sciences Po covers economics, law, history, sociology and political science, while also taking in many interdisciplinary topics such as cities, political ecology, sustainable development, socio-economics and globalization. Sciences Po is home to a research community that includes over 200 researchers and 350 PhD candidates. In 2015, 32% of the university’s budget was devoted to research. That year, 65% of its research publications were in French, 32% in English and 3% in other languages. The university has numerous research centers, seven of which are affiliated with France’s National Centre for Scientific Research (CNRS). Center for Socio-Political Data (CDSP), which provides scientifically-validated data for international survey programs. It also supports training in data collection and analysis. Centre d'études européennes (CEE), which focuses on inter-disciplinary European studies; participation, democracy and government; election analyses; the restructuring of the state and public action. Centre for International Studies (CERI), which produces comparative and historical analysis on foreign societies, international relations, and political, social and economic phenomena. Centre for Political Research (CEVIPOF), which investigates political attitudes, behaviour and parties, as well as political thought and the history of ideas. Centre for History (CHSP), whose research focuses on: arts, knowledge and culture; wars, conflicts and violence; states, institutions and societies; the political and cultural history of contemporary France; from local to global: international history and its levels. Centre for the Sociology of Organizations (CSO), which conducts research on the sociology of organizations, sociology of public policy, and economic sociology. It also studies issues related to higher education and research, healthcare, sustainable development, the evolution of firms, and the transformation of the state. Center for Studies in Social Change (OSC), which conducts research on topics such as urban, school and gender inequalities, stratification and social mobility, and ethno-racial or social segregation. Department of Economics, which investigates areas such as labor markets, international economics, political economy, microeconomics and development. Law School, whose research focuses on globalization, legal cultures and the economics of law. It has also produced work on the theory and history of law, public and private international law and intellectual property. Médialab, which studies the way data generated by new information technologies is produced, circulated and exploited. Observatoire Français des Conjonctures Economiques (OFCE), which is both a research center and an independent economic forecasting body. Its stated mission is to "ensure that the fruits of scientific rigour and academic independence serve the public debate about the economy". In addition to these research units, the university has recently established three major research programs – the LIEPP, DIME-SHS and MaxPo. The Laboratoire Interdisciplinaire d'Evaluation des Politiques Publiques (LIEPP) analyzes public policy based on qualitative, comparative, and quantitative methods. The laboratory has been selected by an international scientific jury as a "Laboratoire d'Excellence" (Labex) that will be financed for the next ten years by the French government. Données Infrastructures et Méthodes d'Enquête en Sciences Humaines et Sociales (DIME-SHS) aims to collect and disseminate data for use in humanities and social sciences research. The Max Planck Sciences Po Center on Coping with Instability in Market Societies (known as MaxPo), was founded in 2012 in co-operation with the Max Planck Institute for the Study of Societies (MPIfG). It investigates how individuals, organizations, and nation-states deal with various forms of economic and social instability. It is located at Sciences Po’s Paris campus. Sciences Po is part of a network of 470 universities, including:Berkeley (US), Bocconi (Italy), Cambridge (England), Colegio de Mexico (Mexico), Columbia (US), Freie Universität Berlin (Germany), Fudan (China), Keio (Japan), the London School of Economics (England), McGill (Canada), National University of Singapore, Oxford (England), Peking University (China), Princeton (US) University of Cape Town (South Africa), King's College London (England), and University of São Paulo (Brazil). In 2002, it co-founded the Alliance program in partnership with Columbia University, École Polytechnique and Panthéon-Sorbonne University. Each year, this program facilitates dual degrees, exchanges and research projects for around 240 students and 80 professors, and organizes around 40 conferences in Paris and New York. In France it is supported by the Ministry of Foreign Affairs, the National Education Ministry, the Regional Council of the Île-de-France and by private sponsors including the utility company EDF. In 2005, it established a doctoral/post-doctoral partnership program with the University of Oxford to provide a platform for comparative analysis of political systems and societies. OxPo, as this program is now known, facilitates academic and student exchanges between the two universities, provides grants for research collaborations, and organizes joint workshops, graduate conferences and seminars. It has a research partnership with Princeton University, providing research grants to encourage collaborative research and teaching initiatives. Sciences Po co-founded the Global Public Policy Network in 2005 in co-operation with the London School of Economics and the School of International and Public Affairs at Columbia University. The network provides dual degree programs that allow students to study at two institutions. It has since expanded to include the Hertie School of Governance in Berlin, the Lee Kuan Yew School of Public Policy at the National University of Singapore, the Graduate School of Public Policy at the University of Tokyo and the Fundção Getúlio Vargas (FGV) at the Escola de Administração de Empresas in Brazil. Sciences Po is a member of the Sorbonne Paris Cité association. Founded in 1871, the nucleus of the school’s research is Bibliothèque de Sciences Po. The library offers a collection of more than 950,000 titles in the field of social sciences. In 1982, the Ministry of National Education made the Bibliothèque the Centre for Acquisition and Dissemination of Scientific and Technical Information in the field of political science, and since 1994, it has been the antenna associated with Bibliothèque Nationale de France. Bibliothèque de Sciences Po is also the main French partner in the International Bibliography of the Social Sciences, which is based at the London School of Economics. Founded in the 1950s, Presses de Sciences-Po is the publishing house of Sciences Po. It publishes academic works related to the social sciences. Sciences Po organizes numerous public lecture events. Recent guest speakers have included Ban Ki-moon, General David Petraeus, Condoleezza Rice, former President of Brazil Luiz Inácio Lula da Silva, Eric Schmidt, Joseph Stiglitz, Sheryl Sandberg, Mario Draghi, UNESCO Director-General Irina Bokova and Harvard University professor Michael Sandel. Since 2007 it has organized the Franco-British Dialogue Lecture Series in collaboration with the LSE and the French Embassy in London. The lectures are held every term at the LSE’s European Institute. In 2019, the QS World University Rankings, based on English speaking publications, ranked Sciences Po 3rd in the world for Politics and International Studies (1st in France), 22nd in Social Policy and Administration (1st in France), 28th in Sociology (1st in France), 69th in Social Sciences and Management (4th in France), 51-100 in Law and Legal Studies (2nd in France). Overall, it ranked 6th in France and 221st in the world.Times Higher Education ranked Sciences Po 50th in the world for social sciences (1st in France) for 2018. Foreign Policy magazine ranked Sciences Po 21st in the world to obtain a master's degree for a policy career in International Relations in 2015 (3rd in Europe). In the 2013 Times Higher Education Alma Mater Index of Global Executives, a ranking of an academic institution's number of degrees awarded to chief executives of the world's biggest companies, Sciences Po is ranked 81st. Due to its prominent alumni, its selectivity and its alumni's high profile, Sciences Po is broadly perceived as an elite institution. However, it has been criticized, along with the École nationale d'administration, for creating in France an oligarchy that it out of touch with reality, '...blinkered, arrogant and frequently incompetent people.' In recent years, however, Sciences Po's concerted efforts, at times controversial, to promote social inclusion in higher education have taken center stage. Central to Sciences Po's policy to diversify its student body is the Equal Opportunity Programme, launched in 2001. The rate of scholarship holders among Sciences Po students has increased four-fold over the past ten years, with 27% of students now receiving scholarships or need-based financial aid. The institution is partly state-funded, and some, especially institutes of political studies in the provinces, have accused it of receiving a disproportionate share of public money. In 2012, for example, Sciences Po Lille student representatives called Sciences Po (Paris) the "coronation of State inequity". Critics have accused Sciences Po of prioritizing access to professional networks over education and expertise. As a result, the school is often nicknamed "Sciences Pipeau" (pronounced and sometimes spelled "Sciences Pipo", "pipeau" meaning "scam" in colloquial French). This nickname has also been employed by students. The sociologist Nicolas Jounin, alumnus of Sciences Po, stated that the school is an "intellectual imposture" and a "financial hold-up". The academic Gilles Devers criticized the institution for being the "base of the conservatism, and the mold of the molluscs that make the public elite" where "dissenting ideas are only admitted if they strengthen the system". The journalist at France Culture Guillaume Erner stated that the institution is "only advertisement and artifice". Sciences Po has also been accused of being unduly helped by the media. "Almost every French newspaper is run by an alumnus of Sciences Po", and most of the journalists in France are alumni from Science Po, so it would give the school "an unparalleled media coverage" and permit it to "cultivate a culture of secrecy" about its internal affairs. "Sciences-Po is under-criticized," analyzes a professor. Former students are unlikely to criticize it. "Those who teach there have no interest, and not necessarily the urge, to do so. Those who are not there can hope to be there one day." The journalist Ariane Chemin stated in 2013 that, because so many journalists come from Sciences Po, the school has an undue good public reputation. Alain Lancelot, director of Sciences Po from 1987 to 1996, was investigated for financial mismanagement by the French Court of Audit. Since 1997, the institution has been hit by a number of scandals, notably concerning the leadership of Richard Descoings, its director from 1997 to 2012. Descoing, president from 1997 to 2012, had been criticized for offering large sums of money (through salary rise, free accommodation, etc.) to diverse members of staff, included his wife, in spite of the fact that Sciences Po is partly stately funded. In February 2012, it was revealed that an inspector of the French Court of Audit, in charge of investigating the financial behaviour of Sciences Po, was at the same time employed by Sciences Po. On 3 April 2012, Descoings was found dead in his Manhattan luxury hotel room during a trip to represent Sciences Po in New York. The police initially concluded that his death had been caused by an overdose, but the final coronary report eventually stated that he died a natural death. Descoings' energy on this last day and the missing phones and computer have raised questions as to the precise circumstances of his death. In October 2012, the Court of Audit reprimanded Sciences Po for financial mismanagement, accusing it of opaque remuneration procedures, unwarranted expenses claims and excessive pay-rises for managers. The Court noted that the university’s complex legal status – a public university managed by a private trust – had contributed to dysfunction and waste. It also criticized the French government for increasing state funding for the university without insisting on additional public oversight. Sciences Po has also been accused to prevail results over morals. In November 2012, Hervé Crès has been dismissed by the government, but he sought to president of Sciences Po anyway, saying that Alain Lancelot and Richard Descoings have been found guilty too, but it doesn’t matter for what concerns the presidency of Sciences Po. In July 2015, Jean-Claude Casanova, the former president of the Foundation Nationale des Sciences Politiques, the private trust which manages Sciences Po, was fined €1500 for failing to properly consult the Foundation’s Administrative Council over budgeting decisions involving public money. The Court of Financial and Budgetary Discipline eventually found Casanova guilty, but sentenced him with leniency because the procedures had some part of regularity and because it wasn’t customary in Sciences Po to follow all the financial rules. In February 2016, the Court of Audit noted that reforms had been made but stated that greater transparency was still needed. Frédéric Mion, director of Sciences Po since 2013, defended the university’s record and asked the judges to write their report again. Over 65,000 people have studied at Sciences Po. Alumni and former staff include thirty-two heads of state or government, including seven of the last eight French presidents (Emmanuel Macron, François Hollande, Nicolas Sarkozy (although he didn't graduate), Jacques Chirac, François Mitterrand, Alain Poher (though he served only as an interim president), and Georges Pompidou), thirteen past or present French prime ministers, twelve past or present foreign heads of state or government, a former United Nations Secretary-General, the former head of the International Monetary Fund, the former head of the European Central Bank and the former head of the European Bank for Reconstruction and Development. Former Portuguese Prime Minister, José Socrates, studied at Sciences Po as a doctoral student in 2012. Among the alumni are CEOs of France's forty largest companies (Frédéric Oudéa of banking group Societe Generale, Michel Bon of Carrefour, Jean-Cyril Spinetta of Air France, Serge Weinberg of PPR, Gérard Mestrallet of Suez, Philippe Camus of Alcatel-Lucent), private bankers such as David René de Rothschild, the CEO of Lazard Italy, the CFO of Morgan Stanley Europe, the Director of Credit Suisse World, Co-founder, Chairman and CEO of TradingScreen and the Chairman of Credit Suisse Europe as well as the current head of the European Federation of Businesses, Industries and Employers and the current head of the French Businesses and Employers Union and many others. Influential cultural figures such as the writer Marcel Proust and the founder of the modern olympics Pierre de Coubertin also graduated from Sciences Po. Senior French diplomats including François Delattre (currently French ambassador to the UN), Gérard Araud (currently ambassador to the USA), Sylvie Bermann (currently ambassador to Russia), Bernard Émié (currently ambassador to Algeria), Jean-Maurice Ripert (currently ambassador to Russia) and Maurice Gourdault-Montagne (currently ambassador to China) are also alumni. Sciences Po is known for recruiting many former or current professionals to give lessons, allowing students to benefit from practitionners and their unique insights on current issues. Many high ranking civil servants give lectures after their daily job, at the beginning of the evening. Instructors included or still include former French Prime Minister Dominique de Villepin, former WTO president Pascal Lamy, former French President Francois Hollande, former French Prime Minister Jean-Pierre Raffarin, former French foreign minister Hubert Védrine, noted historian Pierre Milza, Nobel Prize Laureate economist Joseph Stiglitz and former Economics minister as well as former Managing Director of IMF Dominique Strauss-Kahn. The philosopher, anthropologist and sociologist Bruno Latour has taught there since 2006. Emmanuel Gaillard also teaches at the Law School. ^ "Emile Boutmy, l'inventeur de Sciences Po, modèle du défunt Richard Descoings". ^ "Politics & International Studies". Top Universities. 15 February 2019. Retrieved 27 February 2019. ^ Nord, Philip (2002). The Jacobin Legacy in Modern France: Essays in Honour of Vincent Wright. Oxford: Oxford University Press. p. 116. ISBN 9780199256464. Retrieved 30 May 2017. ^ LSE: A History of the London School of Economics and Political Science, 1895–1995. Oxford University Press. 1 June 1995. p. 73. Retrieved 11 August 2018. ^ a b Paris, Sciences Po, FNSP 27 rue Saint Guillaume 75007. "Home". Sciences Po Stories. ^ "Reform of the civil service". Archived from the original on 13 August 2015. ^ Nord, Philip (2002). The Jacobin Legacy in Modern France: Essays in Honour of Vincent Wright. Oxford: Oxford University Press. p. 138. ISBN 9780199256464. ^ Nord, Philip (2002). The Jacobin Legacy in Modern France: Essays in Honour of Vincent Wright. Oxford: Oxford University Press. p. 141. ISBN 9780199256464. ^ Devine, Summerfield (1998). International Dictionary of University Histories. Chicago: Fitzroy Dearborn Publishers. p. 147. ISBN 9781134262175. Retrieved 29 May 2017. ^ Nord, Philip (2002). The Jacobin Legacy in Modern France: Essays in Honour of Vincent Wright. Oxford: Oxford University Press. p. 117. ISBN 9780199256464. ^ "[Il y a 7 ans] Emmanuel Macron : "Je ne suis pas un héritier"". Emile Magazine. Retrieved 7 May 2017. ^ "Emmanuel Macron, Class of 2001". Sciences Po. Retrieved 8 May 2017. ^ Noack, Rick (29 October 2014). "7 countries where Americans can study at universities, in English, for free (or almost free)". Washington Post. ISSN 0190-8286. Retrieved 5 October 2017. ^ "Sciences Po ― an elite institution's introspection on its power, position and worth in French society" NYU Department of Journalism, 9 September 2003. ^ Kahlenberg, Richard D. (13 September 2011). "An Affirmative-Action Success". The Chronicle of Higher Education Blogs: Innovations. Retrieved 5 October 2017. ^ "Richard Descoings ou la loterie des pauvres », Marianne 2, January 15, 2009". ^ "In France, a Bastion of Privilege No More". The New York Times. 4 September 2011. ISSN 0362-4331. Retrieved 5 October 2017. ^ "Sciences-Po: bienvenue à la Cour du roi Richard!". ^ "Sciences-Po: un "new management" version "management de la peur"". ^ Brafman, Nathalie (2 March 2013). "Un pur produit de l'élite française pour Sciences Po". Le Monde.fr (in French). ISSN 1950-6244. Retrieved 21 June 2017. ^ "Sciences Po ouvre une "École des affaires publiques"". Le Figaro Etudiant (in French). Retrieved 21 June 2017. ^ magazine, Le Point, (3 October 2016). "Sciences Po va ouvrir son "école du management et de l'innovation"". Le Point (in French). Retrieved 21 June 2017. ^ "L'hôtel de l'Artillerie va accueillir le futur campus de Sciences-po". leparisien.fr. 14 May 2017. Retrieved 21 June 2017. ^ "Paris: French students blockade prestigious Sciences Po university". 18 April 2018. Retrieved 9 July 2018. ^ "Our campuses". Sciences Po. Retrieved 6 May 2017. ^ "Le campus". Sciences Po and University of Toronto. Retrieved 6 May 2017. ^ "/ L'Hôtel de l'Artillerie - Sciences Po". www.sciencespo.fr. ^ "Sciences Po achète l'Hôtel de l'Artillerie pour créer un campus dans Paris » VousNousIls". 17 June 2016. ^ "Sciences Po se dote d'un grand campus au cœur de Paris". lesechos.fr. 17 June 2016. ^ "L'hôtel de l'Artillerie, future vitrine pédagogique de Sciences po Paris". ^ "Paris Promeneurs - L'hôtel de l'Artillerie Futur campus de Sciences Po". paris-promeneurs.com. ^ a b "Undergraduate studies at Sciences Po". ^ "Graduate studies at Sciences Po". ^ "Graduate Studies at Sciences Po". Sciences Po. Retrieved 6 May 2017. ^ "Home - Sciences Po Research". www.sciencespo.fr. 3 December 2014. ^ "Research at Sciences Po in 2015". ^ a b c "Research Centers - Sciences Po Research". www.sciencespo.fr. 20 June 2014. ^ INA. "Médialab de Sciences Po : cartographier le web pour les sciences sociales / E-dossier de l'audiovisuel : sciences humaines et sociales et patrimoine numérique / E-dossiers de l'audiovisuel / Publications / INA Expert - Accueil - Ina". www.ina-expert.com. ^ "Research Units - Sciences Po Research". www.sciencespo.fr. 10 March 2015. ^ "Page d'accueil - Sciences Po liepp". www.sciencespo.fr. ^ "What is LIEPP? - Sciences Po liepp". www.sciencespo.fr. 23 September 2014. ^ "Page d'accueil - Sciences Po dime-shs". www.sciencespo.fr. ^ "MaxPo - About the Center". www.maxpo.eu. ^ "Cross-cutting Programmes - Sciences Po Research". www.sciencespo.fr. 6 October 2014. ^ "Search Best Universities and Business Schools Globally 2017/2018". www.masterstudies.com. Retrieved 5 October 2017. ^ "Alliance Program - Columbia Global". beta.global.columbia.edu. ^ "Support Alliance - Alliance Program". alliance.columbia.edu. ^ "OxPo (Oxford-Sciences Po Programme) - Centre - Research". www.politics.ox.ac.uk. ^ "OxPo About - OXPO - Centre - Research". www.politics.ox.ac.uk. ^ "Sciences Po/Princeton Collaborative Research Grants 2017 - Sciences Po Département d'histoire". www.sciencespo.fr. 5 December 2016. ^ University, Princeton. "Sciences Po - International Princeton". www.princeton.edu. ^ "GPPN Mission". 21 October 2009. ^ "Global Public Policy Network" (PDF). ^ "Global Public Policy Network (GPPN)". Global Public Policy Network (GPPN). ^ "Sciences Po Paris Overview: Introducing Sciences Po" Sciences Po Website, 2001. ^ "IBSS Boosts Coverage of French Social Science Journals", IBSS, 2005. ^ "Presses de Sciences Po", Sciences Po Website, 21 October 2004. ^ "Sciences Po: France's Leading University in the Social Sciences". ^ "Justice: A lecture and discussion with Harvard Professor Michael J. Sandel - Sciences Po School of Public Affairs". www.sciencespo.fr. 6 April 2016. ^ "Irina Bokova - Guest speaker at PSIA - Sciences Po psia". www.sciencespo.fr. 7 April 2015. ^ Haas, Annette. "LSE and Sciences Po - Academic partners - Academic Partnerships - Services and divisions - Staff and students - Home". www.lse.ac.uk. ^ Lane, Philippe (8 July 2011). Franco-British Academic Partnerships: The Next Chapter (1 ed.). Liverpool: Liverpool University Press. p. 12. ISBN 9781781386569. Retrieved 23 May 2017. ^ "Global university rankings and their impact Archived 26 August 2012 at the Wayback Machine,". "European University Association". Retrieved 3 September 2012. ^ "QS World University Rankings by Subject 2019". Top Universities. ^ "World University Rankings 2018 by subject: social sciences". 12 September 2017. ^ "Foreign Policy - The Best International Relations Schools in the World". Foreign Policy. ^ "Alma Mater Index: Global Executives 2013". Times Higher Education. ^ Conley, Marjorie (9 September 2003). "Sciences Po ― an elite institution's introspection on its power, position and worth in French society". Portfolio, The Journalism of Ideas. New York University. Retrieved 10 August 2016. ^ Koh, Aaron (2016). Elite Schools: Multiple Geographies of Privilege. New York; Oxon: Routledge. pp. 193, . ISBN 978-1--138-77940-2. ^ Guttenplan, D.D. (4 May 2001). "In France, a Bastion of Privilege No More". The New York Times. Retrieved 10 August 2016. ^ Lichfield, John (17 May 2013). "Liberte, inegalite, fraternite: Is French elitism holding the country back?". The Independent. Retrieved 10 August 2016. ^ "In France, a Bastion of Privilege No More". The New York Times. 4 September 2011. ISSN 0362-4331. Retrieved 9 October 2017. ^ Maillard, Benoît Floc'h et Matteo (16 January 2015). "Sciences Po Paris : 64 % des admis viennent de province". Le Monde.fr (in French). ISSN 1950-6244. Retrieved 9 October 2017. ^ "Sciences Po : le sacre de l'Etat inégalitaire". ^ BEAUVAIS, Anne-Sophie; CAUCHY, Pascal (19 January 2017). "Sciences Po pour les Nuls". edi8 – via Google Books. ^ "L'école de l'élite : Sciences Pipo ? du 05 mars 2013 - France Inter". ^ "pipeau - Traduction en anglais - exemples français - Reverso Context". context2.reverso.net. ^ ""sciences pipeau" - Google Scholar". scholar.google.co.uk. ^ Tabellion, Elsa (21 March 2017). "Sciences Po déçoit-il ses élèves de 1ere année ?" – via Le Monde. ^ Fabre, Benjamin (6 April 2015). "L'art de pipoter: Se faire des amis et triompher en société : mode d'emploi". Éditions Tut-tut – via Google Books. ^ Brunel, Manuel de guérilla à l'usage des femmes, p. 29. ^ "Mon avis sur Sciences Po : "On en sait un peu sur tout, mais on ne sera jamais expert"". ^ Nicolas Jounin, in Il est temps d'en finir avec Sciences Po ! ^ "Sciences-Pipeau : Plus rentable que de braquer une banque ! - Actualités du droit". lesactualitesdudroit.20minutes-blogs.fr. ^ "Les comptes de Sciences Pipo". 9 October 2012. ^ "Ce qui ne se dit jamais sur Sciences-Po et les médias..."
^ a b "Sciences-Po: une stratégie de communication qui élimine les questions gênantes". ^ Ariane Chemin in France Inter, L'école de l'élite : Sciences Pipo ? ^ "Sciences Po : la Cour des comptes demande des poursuites". ^ "Dossier: Sciences-Po, la fuite en avant et les scandales - Mediapart". ^ "La dérive financière de Sciences Po et la complaisance de l'État". 12 October 2012. ^ "La dérive financière de Sciences Po et la complaisance de l'État". Contrepoints. 12 October 2012. ^ "Les dirigeants de Sciences-Po touchent des superbonus". ^ "Quand Sciences-Po salarie son contrôleur". ^ "Cops Believe French Scholar Accidentally Overdosed". Archived from the original on 13 September 2016. ^ "Richard Descoings est mort". 30 May 2012 – via Le Monde. ^ CNN, By Jethro Mullen. "French educator found dead in New York was dynamic, controversial figure - CNN.com". ^ "Educpros : actualités et services pour les professionnels de l'éducation. - Educpros.fr" (PDF). blog.educpros.fr. Archived from the original (PDF) on 28 August 2016. Retrieved 27 August 2016. ^ comptes, Cour des. "Sciences Po : une forte ambition, une gestion défaillante / Archives / Actualités / Accueil / Cour des Comptes - Cour des comptes". www.ccomptes.fr. Archived from the original on 26 August 2016. ^ Floc'h, Benoît (8 July 2012). "La Cour des comptes fustige la gestion de Sciences Po" – via Le Monde. ^ "Document : la réponse de Sciences-Po à la Cour des comptes". ^ "Sciences Po : l'Etat repousse la nomination d'Hervé Crès". Archived from the original on 28 August 2016. ^ "Scandale des salaires à Sciences Po : Jean-Claude Casanova renvoyé devant la Cour de discipline budgétaire". 24 July 2015 – via Le Monde. ^ Floc'h, Benoît (4 December 2015). "Jean-Claude Casanova condamné dans l'" affaire Sciences Po "" – via Le Monde. ^ Décodeurs, Les (10 February 2016). "Ce qu'il faut retenir du rapport de la Cour des comptes 2016 en 7 graphes" – via Le Monde. ^ "Prise de bec entre la Cour des comptes et Sciences-Po". ^ Zerouala, Faïza (11 May 2012). "A l'école des présidents de la Vème République" – via Le Monde. ^ "Biographie de Dominique Strauss Kahn". www.edubourse.com. ^ "José Sócrates: Mais 1 ano em Paris" [José Sócrates: 1 more year in Paris] (in Portuguese). 1 June 2012. ^ "L'ex-premier ministre portugais José Socrates mis en examen". 24 November 2014 – via Le Monde. ^ "Alumni - Sciences Po International". www.sciencespo.fr. 4 February 2015. ^ "François Delattre, porte-voix de la France à l'ONU". Le Monde.fr. ^ D.C., Ambassade de France aux Etats-Unis - Washington,. "L'Ambassadeur - France in the United States / Embassy of France in Washington, D.C." France in the United States / Embassy of France in Washington, D.C.
^ Po, Alumni Sciences. "Manifestation Alumni Sciences Po : Dinner Debate with H.E Sylvie Bermann, French Ambassador to the UK". sciences-po.asso.fr. ^ "Biographie de M. Bernard Emié, Ambassadeur de France en Algérie - La France en Algérie". Archived from the original on 25 April 2017. ^ Mariana Grépinet (6 May 2012). "Portrait de François Hollande en jeune homme". ^ "L'ambassadeur - La France en Chine". Archived from the original on 9 January 2017. ^ "Décès de Pierre Milza, un des plus grands professeurs de Sciences Po". Sciences Po (in French). Retrieved 7 March 2018. ^ "Dans les coulisses de l'IEP Paris". ^ "Bruno Latour - Sciences Po - MedialabSciences Po - Medialab". www.medialab.sciences-po.fr. 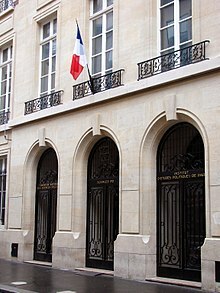 Wikimedia Commons has media related to Institut d'études politiques de Paris.